A former Game of Thrones alum has joined the Avatar movies in a major way. Geoff Johns promises big things for DC’s female heroes in their movie universe. Michael Bay teases how Transformers: The Last Knight sets up all those future spinoffs. Plus, American Horror Story recruits a former Arrow hero. Spoilers now! 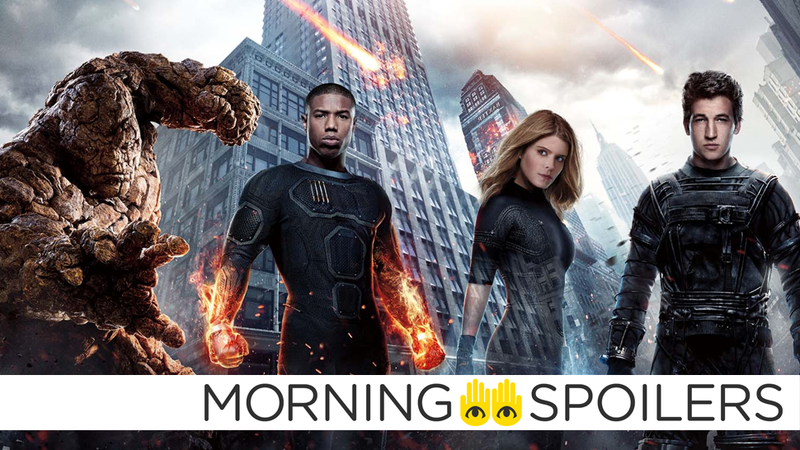 Get those salt shakers at the ready, because there’s not just rumors of a new Fantastic Four film on the way, but one that would allegedly be vastly different from Fox’s past two attempts at bringing Marvel’s First Family to the big screen. Bleeding Cool claims that the film, with a screenplay being worked on by Pride and Prejudice and Zombies’ Seth Grahame-Smith, will refocus on the younger associates of the Fantastic Four rather than specifically the core team of Sue, Reed, Johnny, and Ben. And when we say young, we mean young: the movie allegedly revolves around Sue and Reed’s kids, the super smart (and super powerful) Franklin and Valeria Richards, with Human Torch and the Thing acting as the older, wiser elements of the team. The site further claims that this would naturally be completely removed from the recent disastrous reboot of the property, and would be going for an Incredibles-style lighter tone to further distance it. Obviously this is all to be taken with a very skeptical eye until we here any more about this. THR reports that Corey Stoll and Kyle Chandler have joined the adaptation of James Hansen’s Neil Armstrong biography as Buzz Aldrin and Deke Slayton, respectively. This first film is about establishing the world, and showing Durotan helping his son escape a dying planet,” Jones said. “So to me the idea over the course of three films would be for Thrall to fulfill that vision of Durotan to create a new homeland for the Orcs. So in [the sequel] it would be the adolescent years of that baby, and anyone who does know their Warcraft stories would know it’s very much a Spartacus story that goes on with that character. I would basically follow that through. And with the human side of it, which is a little less clear of how that would follow, but basically there is an aftermath to this film which would need to be completed. And on the Orc side you’re very much following that baby, Go’el, known as Thrall in the universe, and how he eventually creates the Orc homeland. I go to bed thinking about it, I wake up thinking about it, and during the day, I have my notebook where I’m jotting down ideas and visuals and music. It’s so up my alley in terms of these two female characters and who they are and what they’re about. It’s the perfect way for me to dive into the Marvel universe, to focus on these two women who I really respect and can’t wait to bring to life. Rob Liefield is reportedly developing The Futurians for film and television, according to Clifford Meth, a representative of creator and comic artist Dave Cockrum’s estate. Paty Cockrum and I are delighted that Rob Liefeld is taking on the Futurians. Dave Cockrum was best known as the creator of Nightcrawler and the designer of Marvel’s X-Men icons Storm, Colossus, Thunderbird and Mystique. But The Futurians were by far Dave’s favorite characters that he created. His graphic novels for Marvel and other companies that featured The Futurians were beloved by Dave’s fans. Decades later, they are still sought after by collectors. Rob Liefeld is the perfect creator to take on this project. Rob is a fan-favorite storyteller whose personality, like Dave’s, is comics incarnate. He loves the medium, grew up on Dave’s work, and developed a number of his own extremely popular characters such as Deadpool and Cable. Rob will know exactly what to do with The Futurians and we can’t wait to see it. Geoff Johns revealed to Variety he’s currently co-writing a treatment with Patty Jenkins. Patty and I are writing the treatment right now. The goal is to make another great Wonder Woman film. I had a blast making it with Patty the first time. We’ve got a cool idea for the second one. Speaking with Fandango, Michael Bay revealed The Last Knight will serve as a “launching board” for future spinoffs like Bumblebee. This one’s much more about mythology and in terms of storyline, it’s kind of the deeper of all five of them. This movie is much more of an adventure. There are two very strong female heroes in this movie that I like very much and it’s kind of got a different bent on it than we’ve normally done on other Transformers movies. If you watch it closely, there are a lot of ways that this movie can go from here. So it’s basically like a launching board for wherever the series will continue. According to DC film executive Jon Berg, Joss Whedon is already a “big part” of the DCEU, between his work on Justice League and Batgirl. Colton Haynes has joined the cast of season seven. David Harbour told TV Guide that “Justice for Barb” is a “big” theme of season two. Prepare your memes now. Barb is clearly dead. But as a result, I think, of some of the fandom and also as a result of what we want to explore, justice for Barb is a big thing in Season 2. Barb was not given the justice she deserved in Season 1 because we were focused on Will and saving a child, but so we’ve realized from the fans that Barb is important, and so we are going to treat her with the respect that she deserves. “Blood Tax” — Imprisoned as a subject in a strigoi breeding program, Dutch is desperate to escape and find Setrakian. Gus recruits his cousin for the inside job that will put his gang at the top of the new world’s underground economy, but Creem is suspicious of his business partner’s ambitions. “One Shot” — Quinlan and Fet discover that stealing a nuclear warhead isn’t easy when they encounter an unexpected enemy. Eph and Alex concoct a new weapon to use against the strigoi. Frustrated with his seclusion, Zack discovers a love interest. Finally, AMC has released a whopping 30-minute catch-up video to get you acquainted with the Saint of Killers before season two.